You could adjust the width from 0.9in / 22mm to 2.8in / 70mm by turning the screw. ➤Size: 7" x 4" x 2"
【Adjustable Size】Adjustable for laptop width with thickness from 0.9in / 22mm to 2.8in / 70mm, you could adjust the screw to tighten down to correct size. 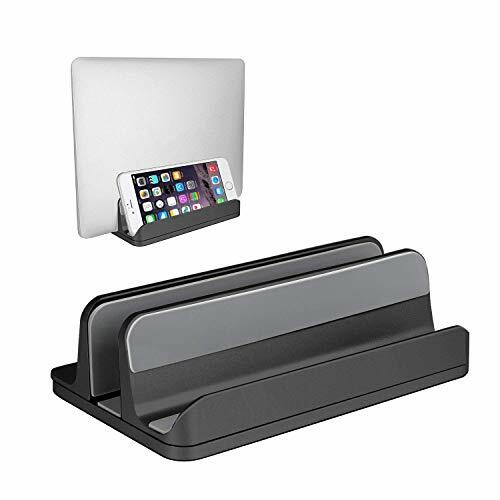 【Laptop Stand & iPad/iPhone 】2 in 1 design makes it convenient to place your laptop and iPad/iPhone. Compatible with Apple MacBook Pro/Air, Microsoft Surface, Gaming Laptops, Notebooks, Dell Samsung Lenovo Acer Sony Asus XPS and HP ENVY Series, etc. 【Protective and Stable】Anodized aluminum is scratch-resistant and durable. Non-toxic silicon mate protects your MacBook from being scratched and secures it in stable position. 【Space Saver】Cradle up the monitor vertically, keep your laptop away from any spills, build up a neat and organized space for your desk. 【100% Free-risk Guarantee】Vertical laptop Stand * 1, Allen Key * 1, 12 Months Warranty Card * 1 in the package. Please contact please contact us if you have any question. We will respond within 24 hours. If you have any questions about this product by JARLINK, contact us by completing and submitting the form below. If you are looking for a specif part number, please include it with your message.